Spiral reinforced Clear Hose allows easy inspection for locating potential clogs in your duct work. Uses LH fittings. Made in the USA. This dust hose worked great for my new bandsaw and hooked up easily to my new Grizzly Bandsaw and new Grizzly Dust collector. Great item and plenty strong! 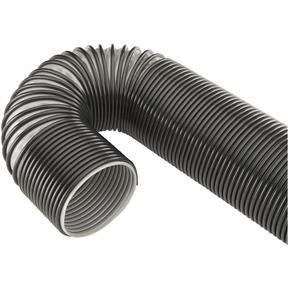 Great value, hose fits snug on fittings and is quite flexible. Need to replace weathered hose. The great thing about this hose is that I can collapse it when finished & keep it out of the Arizona sun, which is what ruined my last hose. For my application, the older, more rigid tubing would have worked better. This pipe is very heavy duty and it looks like the next bedt thing to rigid pipe. Once I figure out final position it will be great. Only have temporarily hooked up so it shrinks back all the time, but there is no excess hose on the floor coiled around. Good but tough to install since it wants to retract back to it original size. This hose is expandable and collapsible. I wasn't sure if I would like it but it is turning out to be handy. All my machinery is mobile, so when I need a hose I expand it out to the machine and when I am done I collapse it back. My guess is it is about 4:1. So a 2.5 ft hose expands to 10 ft. The hose is also as thick and durable as any other cheap hose I have bought. I bought this item one month ago, while it performed the task i needed it for I do not like the way the hose wants to recoil back to its original length. I always having to stretch it out. I wish I would have gotten a hose that would not collapse back but would remain the the needed length. Flexible but firm enough to stay where I want it to stay. Good fit with my Grizzly band saw.